Dress your table top up with this Beaded Giraffe Print Placemat from Toss Designs. Sold individually, these placemats measure 15 inches square and have a fabric backing to protect your table surface. 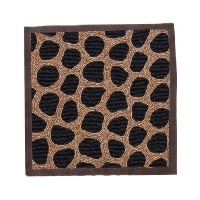 The intricate beaded placemat comes in a sophisticated brown and black giraffe print with black border. These placemats look great on any dining table and will add a wildly fashionable look to your dinner.